View Of Bombay, From Mazagon Hill. 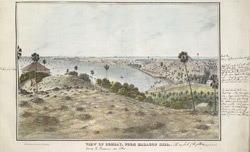 bl.uk > Online Gallery Home	> Online exhibitions	> Asia, Pacific and Africa Collections	> View Of Bombay, From Mazagon Hill. Plate one from J M Gonsalves' "Views at Bombay". Mazagon hill was an outlying suburb of Bombay and became a fashionable place to live in the 18th century. Bungalows and plantation houses were built by the British and more affluent Indians moving out of the crowded fort area. During the 19th century, Mazagon experienced a decline as residents moved into the fashionable Bycullah area nearby. The docks were reclaimed towards the end of the century and Mazagon was left landlocked; eventually the fumes from the developing mills drove out any remaining affluent residents.